Of the Mekong delta, travel writer and sometime VeloAsia guide Michael Buckley notes "with the delta on Saigon's doorstep you would think the place would be overrun with tourists. Not so. This sprawling "rice bowl" is little traveled, yet offers a wealth of sights and experiences for those who care to explore. If you make the effort you'll be amply rewarded. The delta is a region of extraordinary energy and market commerce, with burgeoning markets, floating markets, fruit orchards, and more coconuts than you'd want to contemplate. The delta is a relaxing place, with good food (seafood! ), pleasant river trips, travel by boat, and friendly people." Much of the delta is covered with emerald green, waterlogged rice paddies sprouting fields of rice. At the mouth of the Mekong, the delta covers over 26,000 square miles and you're never far from water in the delta, and boats in some districts are the main mode of transportation on the crisscrossing muddy channels and streams. Intriguing in the backwaters are the floating markets, which have disappeared in other parts of Asia. In a hyperactive country, the Mekong Delta is the most dynamic region. However, our Mekong tour travels some of the quietest back roads in the country, with frequent side trips by the delta's primary mode of transport  sampan (boat). Drift in small sampan through bustling market places and riverfront villages, stopping into homes, cottage industries, and crafts villages, along the way. Cycling through the bustling markets is always a highlight. If you want to avoid hills, and enjoy Vietnam's warmest weather, this tour is also your best bet  aside from Sam Mountain, the delta is flat as a pancake and always warm. We pause frequently along the route to take in the people, sites, markets and other distractions. If you are a cyclist looking for high mileage we can accommodate a full-day in the saddle schedule. This trip is the highest quality tour of the Mekong, not only deluxe accommodation, but also bicycles, support vehicle and experienced cycling guide. Aside from the beautiful expanse of emerald green rice fields, there is a short hike up Sam mountain affording views of neighboring Cambodia, and a stop for tea at a wonderful bonsai garden. An optional visit to the Thot Nhot Stork sanctuary is possible. Accommodation is at one of our past traveler's favorite places, the French Victoria Resort in Can Tho, an oasis in the Mekong and the perfect place to relax by the pool, have a massage, and fuel up on a delicious banquet prepared by a talented French chef. Enjoy the highest quality bicycle tour in the Mekong. Our bikes are newer, imported Trek hybrids -- perfect for cruising the Mekong. 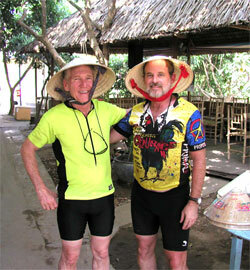 Our guides are cycling guides, with a minimum five years leading tours in the Mekong Delta. For extended adventure, there are options for continuing on to the deserted white sand beaches Phu Quoc Island off the southern tip of Vietnam, by pleasant boat cruise to sleepy Phnom Penh Cambodia, or laying over in Chau Doc on the border. Also, consider combining this trip with two World Heritage Sites, one the prize of Southeast Asia: the grand Khmer temples at Angkor in neighboring Cambodia with a vast concentration of ruins that rivals the Nile Valley, and our picturesque kayak trip through the karst wonderland of Halong Bay. We organize the highest quality private trip into the Mekong Delta. Real bikes, expert guides, and luxury accommodation (this trip stays at the fabulous Victoria Can Tho resort). 16 years experience. We were the first to organize cycling trips in Vietnam and still organize more than any other company. Secret routes, paths, unique activities and places few travelers tread. Pre- and post-tour care. Want to arrive and depart, enjoying your vacation with no concerns in between? We've got you covered. Read about our trips in National Geographic Adventure, The New York Times, The Men's Journal and dozens of newspapers and blogs. We have also been featured on NPR and documentaries. Note: we have options for longer or shorter tours in the Mekong, from 2 to 7 days in length — please contact us for more information. This trip is suitable for children and has been done by children of all ages and we can provide a sitter to accompany you.